Jiminy Peak is close to our Mass Bed and Breakfast. Now that the holidays have passed and the cold days of winter are stretching before us, it’s time to think about ski getaways in the Berkshires. Our Berkshire B and B is close to several terrific downhill ski areas. 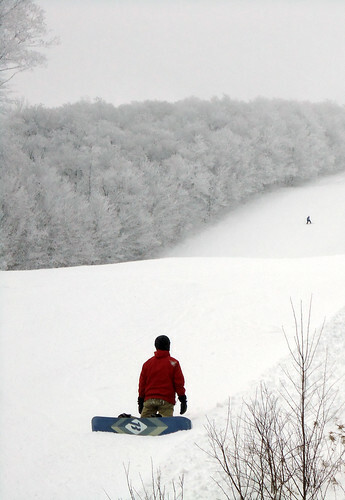 Ski Butternut, in Great Barrington, is about 12 miles from the inn. Catamount Ski Area, in Hillsdale NY, is about 20 miles from here. Jiminy Peak, up in Hancock, Massachusetts, is about 30 miles from our inn. Although we haven’t received a healthy dose of snow since the Great Halloween Blizzard of 2011, all three ski areas are open, and all are making snow. Ski Butternut is open weekdays 9 a.m. to 4 p.m., and weekends 8:15 to 4 p.m. This area also offers snow tubing on holidays and weekends. Catamount Ski Area is open daily from 9 a.m. to 4 p.m (it opens at 8:30 on weekends); night skiing is offered Wednesdays and Thursdays from 3 to 9 p.m., and Friday and Saturday from 3 to 10 p.m.
Jiminy Peak is open open daily from 9 a.m. to 10 p.m. (opening at 8:30 a.m. on weekends and holidays). Live music frequently entices skiers to linger after leaving the slopes of Jiminy Peak. A full calendar of events is listed at Jiminy Peak. Skiers who stay at our Mass Bed and Breakfast Monday through Friday will receive two free lift passes for Butternut Ski Area, or discount passes to Jiminy Peak. If you’d rather ski Catamount, take advantage of our three night, $50 Special Package and put the savings towards your ski tickets. Details about these and other specials are available on our Bed and Breakfast Berkshires Specials page. Why not stay for several days and try all three ski areas? Folks who are traveling from New York City, Hartford, or Boston may find that stretching out a weekend makes the most sense; instead of driving out here every weekend, come out here every other weekend for three days. Less driving, more skiing. Wonderful.